Roger Longman is proof you create farmhouse, artisan cheese and still compete at a world class level to gain the ultimate recognition. Ann Hardy meets the current champion of the British Cheese Awards. Goat farmer Roger Longman has seen his share of ups and downs in the dairy farming and processing industry. As the son of a Somerset farmer and Cheddar cheesemaker, he has been involved with milking cows and cheese production since he was a child. But he has also learnt from bitter, first-hand experience, the importance of meeting the appropriate market sector and how getting it wrong can have catastrophic financial consequences for a business. It is this sharp focus which has driven White Lake Cheese – the company he now runs in partnership with cheesemaker Peter Humphries – to the pinnacle of success it enjoys today. 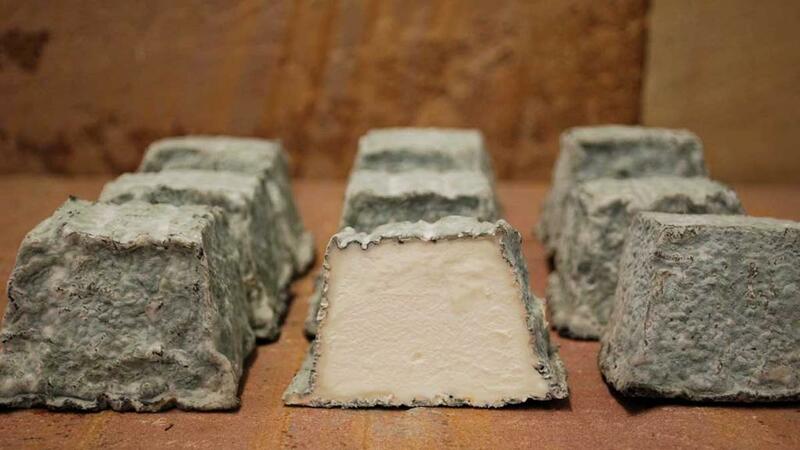 Handmade at Higher Bagborough Farm, near Shepton Mallet, their 28-strong range of sheep and goats’ cheeses includes the current British Cheese Awards champion, Pavé Cobble – a light ewes milk cheese with a mousse- like texture – and Burrow Mump, washed in Somerset cider brandy and matured for three months. But the British artisan cheese industry has not always been so buoyant and Roger recalls how, as a child, he disliked having to turn the Cheddar as part of the cheesemaking process. His antipathy for making cheese and a lack of interest in milking cows set him on course for a life outside farming, and, having studied engineering at Reading University, he embarked on a career with Massey Ferguson. The 20kg blocks, which were cut by hand at Higher Bagborough Farm, near Shepton Mallet, were neither able to compete on price with the large-scale factory producers, nor sufficiently differentiated to attract a niche clientele. “The expensive end of the Cheddar market was for round truckles and even they were struggling at the time,” he says. “But we were producing rectangular blocks by hand which were expensive to produce, but in the middle ground of the market. The cheesemaking facilities were laid to rest in 1997, leaving intense sadness at the loss of long-term staff who were described as almost part of the family. The herd of 400 Holstein Friesians was largely retained and rationalised, but Roger admits he was not inspired to stay at home and milk cows. The answer was to streamline the cows into one 300-head unit and bring goats on to the 280-acre farm to gradually take their place. “It’s hard to start in goats and sourcing stock is one of the problems, so we started with 100 head of anything I could find,” he says. But a chance meeting with accomplished and renowned cheesemaker Peter Humphries set a process in motion which would lead to the business of today. “I had the cheese building and the milk. Peter brought the skills and off we went,” he says. Never having made cheese with goats’ milk before, the pair learned by trial and error at a time when the goat cheese market was ‘almost non-existent’. “You learn by your mistakes, but you have to wait three months to get the results, and then – even if you remember what you’ve done – you have to be able to repeat the process,” he says. This was further compounded by changes in the seasons, temperature, humidity, milk quality and other imponderables. Highlighting one of the differences between an artisan cheese and one made in a factory, Roger is forthright in his thinking. “Big factories do it by numbers; by taking out all of the variables in the room. That’s why they’re so bland,” he says. Eventually arriving at a consistent range of cheeses within two or three years, the team at White Lake tested their product at farmers’ markets before ever approaching a wholesaler. Gradually building up the range of products and increasing the quantities made, the cheesemaking business eventually returned a profit after four years of trading, and by 2008, was in need of extra help in the cheese room. Opting to take on the additional cheesemaker’s role himself, Roger says: “It was brilliant – I loved it. I had finally found what I wanted to do. At the time of returning to the business, a range of cheeses were being produced along with a range of ash-coated cheeses. “Customer demand was growing and restaurants wanted to offer English rather than French goat cheese,” he adds. “I believe Rachel, a semi-soft unpasteurised goat cheese, is unlike any other you have ever eaten as the beauty of the British system – unlike that in France – is its absence of restrictions. With 28 now in production, Roger says transport represents a large part of the cost, but can be substantially reduced when wholesalers buy several types of cheese at a time. He also closely values the quality of his milk, which is used unpasteurised direct from the farm in its ‘undamaged’ state. “We have complete control over the milk – from the breeds of goat to the quality of feed – and it’s very important it is produced on this farm,” he says. Cows have gradually made way for goats at Higher Bagborough Farm. Today, Roger milks 700 mixed and cross-breeds including UK Saanen, French Alpine, British Alpine and Toggenburg. Their production stands at 3.5 litres/day at more than 5 per cent fat and about 3.3 per cent protein. Females are bred by natural service to kid once a year and all females are kept as replacements for the expanding herd. “Goats are kept indoors on straw, as they are browsers rather than grazers and also have no immunity to worms,” he says. Additional concerns about TB also make housing the safest option. Around 40 billy goats are required for breeding, and these are produced at the farm by AI. “But goats are hard to spot bulling, so we don’t use AI for the main herd – and activity monitors would also get chewed to bits,” he says. Kids are removed at birth and fed pasteurised colostrum as part of the process of becoming Johne’s-free. “Baby goats are reared more like baby pigs than calves – they need warm, ventilated buildings with a small amount of air flow as they have no fat to protect them and don’t like drafts,” he says. Many health concerns are similar to those in lambs, so nannies are vaccinated with Lambivac against clostridial diseases to pass immunity to the kids, and the kids are vaccinated at three weeks. A particular concern in the adults is their susceptibility to listeriosis, so they are always fed hay instead of silage, which has the potential to harbour listeria. With 20 per cent growth year-on-year despite ‘insufficient effort’ directed towards marketing, the owners have confidence the company will continue to grow. Looking ahead, Roger hopes to increase numbers to 3,000 in a new unit in three years’ time. “We see our growth coming from exports,” he says. And with a firm desire to also become a cheese affineur (maturing cheeses using a blend of skills and caves) the quality and diversity of White Lake cheeses may improve further yet. “There is absolutely room for growth for others in the industry as well as ourselves,” he says, always offering support and guidance for prospective new entrants. “I feel very lucky to have this farm and to have this opportunity and to do what I do – I like to pass on what I can. “The principle of cheesemaking is simple,” he adds. “The actual reality is quite hard. It’s about growing the right mould, having the right conditions – and repeating the process when you’ve got it right.